1 Easier ejection of Morse-taper tools using a rod or knock out bar. 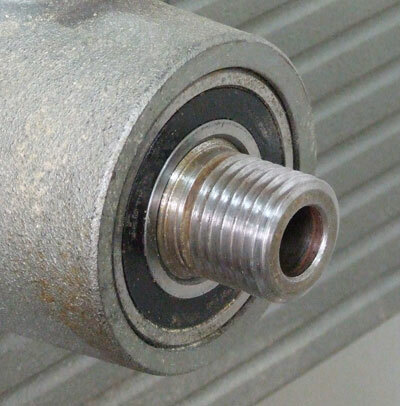 With non-hollow spindles, the safest method of ejection is by an ejector which fits the spindle thread. 2 Morse tapers are easier to keep clear of debris, because they can be blown or brushed through. This reduces the likelihood of debris interfering with the correct seating of the tool in the Morse taper, and the possibility of the tool slipping. The latter could score, damage, or destroy the mating surface of the Morse-taper bore. Once damaged, the Morse taper's efficiency is compromised, and damage may also be caused to other Morse tapers put into the spindle. The spindle loses its ability to hold tools securely, and may need replacing, an expensive job at best. 3 Economy and speed in feeding long lengths of wood through to a hollow work-holding device. This is especially relevant in production work, where only the end of the timber would be wasted, against the sacrificial holding point needed on individual pieces. Through-bored or hollow spindles allow some work to be reversed in the chuck without tailstock support, allowing the end to be detailed. 4 Adding a draw bar improves the security of Morse-taper-based tooling. This is particularly important where the tool's cutting action pulls directly at the taper, such as when turning with a chisel away from the headstock or, in the case of a drill or boring tool which tends to bind, when withdrawing after cutting. This method of holding requires the Morse-taper tool to be made with a threaded end section to take the draw-bar. A draw-bar can also help counteract the effects of a damaged or worn Morse-taper bore. Some lathes let you turn at both ends of the headstock. They are usually of a fixed headstock design. To differentiate between the two ends they are referred to as Inboard, or over-bed, and Outboard (as seen from the turners view). 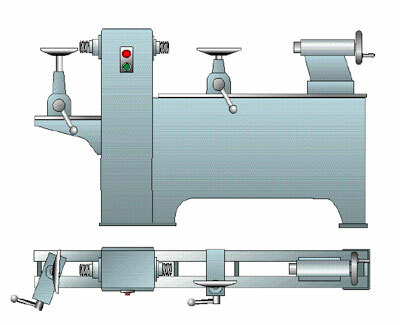 Because lathes usually have a main direction of rotation, the thread on the outboard end will be left-handed (opposite handed to the inboard side), or outboard extras would tend to unscrew, with bad results. Both fittings can be engineered to have the same thread size. For example, both threads could be 1 1/2in x 6tpi, allowing dual-threaded accessories - those with a left and right-handed thread machined into them. There is a practical limit of about 25mm (1in), providing the thread is of a fairly coarse pitch. But most machines don't have this facility, usually having different fitting sizes on each side. This need to duplicate accessories, particularly chucks, makes this type of design more expensive. There are advantages as well as disadvantages with this type of lathe. "Morse tapers are easier to keep clear of debris"